An arctic blast will hit the shores of Lake Travis just west of Austin, Texas on December 8, 2012. The Polar Bear Mud Run will test your survival skills with 18 plus themed challenges.Our course will wind across the shores of Lake Travis and through the picturesque hill country landscape. Participants will encounter a variety of challenging terrains. You will negotiate the iceberg shuffle, conquer the Mt. McKinley summit, endure the Iditarod sled pull,experience a 30'' foam avalanche, igloo crawls, traverse the chilling waters of glacier bays and of course crawl through the mud pits of the Yukon. We subscribe to the ethos "No Mudder Left Behind" so teamwork is paramount.We will recognize achievements with recognition with a variety of fun prizes and awards.We have not forgotten the kids! We will have a 1K with mud and adventure just for them. After the race, you can "chill" with live music, BBQ, inflatable toys and sledding on a "snow" covered hill. A family friendly atmosphere with a variety of community organizations represented and local craftsmen will display items excellent Christmas gifts. Experts will lead warm up and cool down periods and provide nutritional advice. 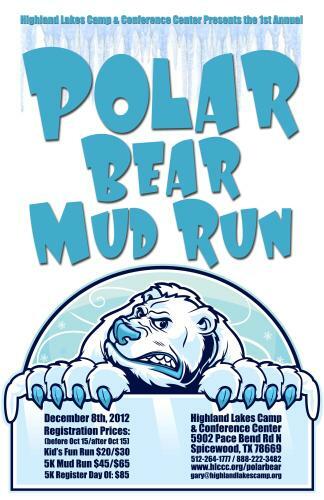 There is something for everyone at The Polar Bear Mud Run!